This post was written by Hatchet reporter Cameron Soojian. 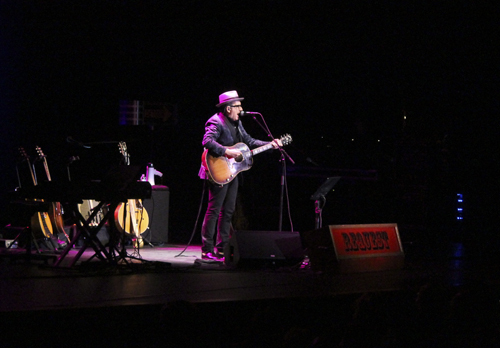 Angelic acoustic guitar chords and classic songs reverberated throughout Lisner Auditorium Friday when Elvis Costello took the stage. The legendary musician, who was inducted into the Rock and Roll Hall of Fame in 2003, performed solo for over two hours in front of a sold-out crowd. Costello played more than 25 songs. Costello started the show with an acoustic set, opening with “Green Shirt.” The predominantly middle-aged crowd cheered as Costello’s iconic voice rang throughout the historic music hall while he played choppy, yet coherently rhythmic accompanying guitar chords. Costello then moved to a playful rendition of “Walkin’ My Baby Back Home” by Nat King Cole. In the middle of the song, he stopped singing and began whistling a solo while continuing to play rhythm on the acoustic guitar. A “request” sign was activated by Costello via foot-pedal towards the end of the show to initiate a request hour, prompting calls from audience members hoping for a rendition of their favorite songs. “Play ‘Alison’!” yelled one audience member from the far back corner of the auditorium. Costello acknowledged the suggestion, but before he began to play what many consider to be one of his signature songs, he stepped away from the microphone. The crowd took to their feet and stepped closer as he began to speak. Silence ensued as Costello played off-microphone, but some fans could not resist singing along with the song’s memorable chorus and diluted the purity of the moment. When he played “Watching the Detectives,” the first hit single credited to his backing band, the Attractions, Costello switched from acoustic to electric guitar. During the chorus, audience members smiled as they clapped along and danced in their seats. Throughout the song and the entire show, Costello experimented with a loop pedal, which allowed him to record and overdub live small clips of guitar. After recording a musical phrase and looping it, he immediately began soloing or recording a new loop to layer over the first one. Costello is currently touring along the east coast and will play four nights accompanied by The Imposters in December.